The chairman of an authority created to oversee construction of a tunnel around Line 5 in the Straits of Mackinac says the agency no longer exists. LANSING — The Mackinac Straits Corridor Authority no longer exists — and therefore could not sue Michigan Gov. Gretchen Whitmer’s administration for halting plans to build a tunnel around Enbridge Energy’s Line 5 oil pipeline. That’s the opinion of Mike Nystrom, who served as chairman of the corridor authority — a body GOP lawmakers created in December to approve and oversee construction and operation of the bedrock tunnel that was expected to cost Enbridge up to $500 million. “Based on my understanding, [Whitmer’s] decision more or less abolished the authority. And therefore, it makes it somewhat challenging for us to be the ones to take legal action against the decision,” Nystrom, of East Lansing, told Bridge Magazine Monday. Nystrom’s comments came four days after Whitmer ordered state agencies to halt action on the tunnel plans. Her order followed a legal opinion from Attorney General Dana Nessel, a fellow Democrat, that found lawmakers violated the state constitution when they enacted Act 359, the law creating the corridor authority. Whitmer’s order drew praise from environmentalists who want the 66-year-old pipeline shut down for fear of a rupture in the Great Lakes and opposition from Republican lawmakers who argue the tunnel would protect the Great Lakes — and the flow of energy to the Upper Peninsula. Questions are swirling about what’s next for the tunnel plan. Senate Majority Leader Mike Shirkey, R-Clarklake, vowed last week the GOP-controlled Senate would ensure the corridor authority could defend the tunnel deal in court. But Nystrom doubts the board would get that chance, because it no longer exists. The board, which approved tunnel-related agreements in December, initially had loose plans to meet later this spring. Now Nystrom said he is in waiting mode. During its short life, the corridor authority has gotten legal direction only from the attorney general’s office, and that guidance completely halted once Nessel succeeded Republican Bill Schuette in January, Nystrom added. “I’m hopeful that the current administration can come together with Enbridge and figure out a positive path forward and ultimately avoid having to hammer this out in the courts,” Nystrom said. Whitmer’s press secretary, Tiffany Brown, released a statement that echoed Nystrom’s conclusion. “The attorney general has concluded, and the governor agrees, that Act 359 violates the state constitution. As a result, any action that depends on the Act — including the creation of the Mackinac Straits Corridor Authority — is void,” Brown said. And last week, Deputy Attorney General Kelly Keenan sent a letter to corridor authority members advising them "to refrain from any further action to implement" the law Nessel found constitutionally flawed. Enbridge last week defended its tunnel plan. The Canadian pipeline giant is still weighing its next steps, spokesman Ryan Duffy told Bridge on Monday. “But we will definitely be working with the administration on a path forward,” he said in an email. "opposition from Republican lawmakers who argue the tunnel would protect the Great Lakes — and the flow of energy to the Upper Peninsula." I can't believe people are still saying this. The energy flows SOUTH thru the pipeline, through the UP, down thru the mitten, and then under the St. Claire River near Sarnia. 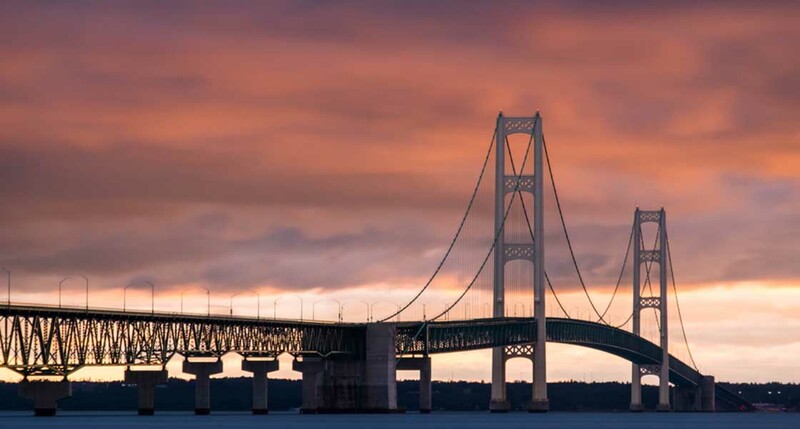 If line five were stopped at the Mackinac Bridge, it could still provide natural gas to the Upper Peninsula forever. This pipeline sends Canadian oil and gas from Edmonton, Canada to Sarnia, Canada. And it goes EAST thru the UP, then SOUTH thru the mitten, not "up to the UP." Close down line 5. Note that Enbridge has another pipeline that also starts at Edmonton, and also ends up in Sarnia which goes south thru Wisconsin around Lake Michigan near Chicago, and ends at Sarnia. Don't let anyone tell you that going under the straits is the only way to go. Nonsense. Google "line 5 map" if you don't believe me. Please research the benefits of Line 5 more instead of listening to opponents messaging. Basically every UP legislator supports Line 5 as they realize the benefits it provides to the UP and the state. It would not be feasible for Enbridge to operate a 30" pipeline from Superior, WI to Rapid River, MI only for propane. Propane is extracted from natural gas liquids and many of the liquids left over from extracting the propane are put back into the pipeline for processing further downstream. Also some of the crude oil is delivered in Michigan in ST. Clair County. What benefits??? The UP or event MI do not get any money from the pipe line>>> AND remember that break in Jackson county a few year ago? A pipe line ran by these same people!! And the state of MI had to pay for the clean up thanks to the RIGHT WING controled MI SPERM court!!! What do you mean by money from the pipeline? Michigan citizens currently receive cost efficient transportation and safe delivery of propane and crude oil that we all use from the pipeline. Enbridge is also a big taxpayer in many of the rural counties that it traverses and in some counties is the largest. The leak in Jackson county was not from an Enbridge pipeline. They made a big mess in 2010 in Kalamazoo and stuck to their promise to stay and cleanup the river until the job was done to the EPA and State's satisfaction. why won't enbridge tell us the exact volume of propane supplied to Yoopers each year? several studies (gary street, London Economics International) have indicated it amounts to one railcar or 3 trucks a day. rail spur from start of line 5 at superior, wisconsin ends a mile from rapid river. dynamic risk alternative study of 2017 (paid for by enbridge) projected a temp increase in UP propane prices of 5 cents a gallon if line 5 shuts down. risk to great lakes from 23 million gallons a day going thru straits (with 95% of product delivered to sarnia) is beyond comprehension. little benefit versus huge risk equals no brainer. michigan has no obligation to be a permanent shortcut to get alberta oil to sarnia for canadian market and export. Ohio that service the Michigan market for petroleum products. Bingo Dan. You are speaking the truth rather than the total misinformation about the U.P. If Enbridge truly feels they need Line 5 let them reroute it 5 totally through Canada to Sarnia. Ha, that's not going to happen! The Canadians know Enbridge too well and aren't about to let them pollute Canada! Again Rick who's on the other side of the lake from MI? Begins with a C, ends with a.. You think they wouldn't be affected by your imaginary leak? So all of the UP and northern lower legislatures have it wrong? Michigan Agency for Energy also had done studies on the benefits of Line 5 to Michigan residents. Not sure whom else you need to get reports from to come to the realization that the pipeline is needed and Michigan has received benefits from it for over 65 years. What's your alternative? my alternative is to get any oil pipeline our of our great lakes. michigan has no obligation to get alberta oil to sarnia. where does that come from? almost 90 communities, counties, boards, tribes, twps. cities in northern michigan adopted resolutions asking snyder to restrict line 5. right of ways for current pipeline would be sold and go back on county tax rolls. 23 million gallons going daily thru the straits during the 7-10 year projected build. when pumping oil - 95% goes to sarnia -when pumping ngls (propane) that figure jumps to 98%. almost nothing stays in michigan -- not that having all of it stay in michigan can possibly justify risking our pure michigan waters. one year anniversary of the anchor drag which dented and gouged line 5 was yesterday. any captain worried about htting the bridge will drop an anchor immediately. quit shilling for canadian oil. let enbridge sue. state should ask for a jury trial. let enbridge pick the jury--the choice is between pennies more a gallon for gas or propane--versus risking the upper Great Lakes to get Alberta oil to market in Sarnia. jury would be guaranteed to deliberate at least 15 minutes before returning a verdict against any risk to our pure michigan. wouldn't the U.P. be a great place for a windfarm? Yep The Gaurden are has lot of them and BILLIONS of anti-wind farms through out the UP put up by the oil and gas companies!!! No too far away from users! Besides running transmission lines under water could electrocute the fish!!! Too much risk. what the article fails to mention is that we have less than 12 years to reduce greenhouse gas emissions by 45%. that means if enbridge and the oil & gas industry have a future, your kids and grandkids will pay the price. whitefish in the great lakes are spawning a month later. on the inland lakes we are starting to lose colder water fish species. storm intensity has increased around 45% in the past decades. if this does not concern you, consider the health of those who are stuck living near refineries in the most polluted zip code in the state and in chemical valley, ontario. heart disease, lung cancer, and asthma enbridge has gotten 66 years of profit from this asset. time's up. And , while all the debate and political posturing continues, the chance of a major environmental catastrophe looms even closer. Consider what would happen to all the states surrounding the Great Lakes should a terrorist attack occur.